Your body requires an additional 200 calories per day during the 40th week of pregnancy. This often leaves you feeling constantly hungry both night and day. 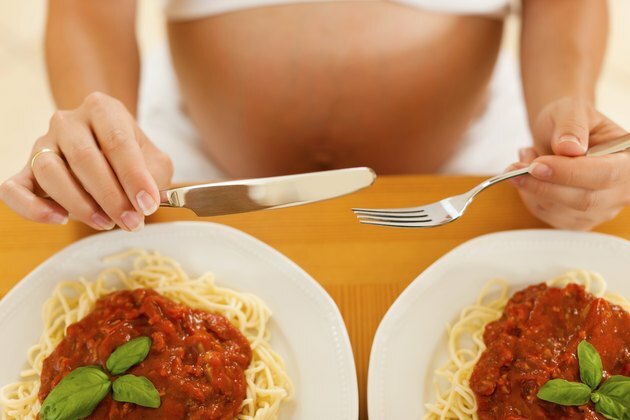 Because relentless hunger is uncomfortable and sometimes leads to nausea if you allow your stomach to become empty, it is imperative to understand how to satisfy your hunger during the last week of pregnancy. Your appetite increases throughout the last trimester of your pregnancy as your baby demands more calories and nourishment to finish growing and developing. This is especially relevant if you failed to gain very much weight during the first two trimesters of your pregnancy and your body is struggling to catch up. Your body also sends out hunger cues to quell the nausea that crops up at the end of pregnancy as the result of your baby and uterus pressing against your stomach. Separate your meals into five or six smaller meals throughout the day. This way you will continuously feel full without being overstuffed, which is especially easy to feel when there is so much limited space in your belly area. Eat snacks, meals and drinks that are nutritious so that they fill you up for a longer period. Have a healthy, light snack such as dried fruit, fresh fruit, cottage cheese or a hardboiled egg between meals as hunger pains strike. Even if you are starving, avoid foods that are high in calories, fatty, acidic, spicy or nutritionally empty. Although these types of foods might temporarily satisfy your hunger or boost your blood sugar levels, the effects will wear off quickly and leave you feeling ravenous. In addition, foods like these often lead to indigestion and unhealthy weight gain, which is potentially dangerous for both you and your baby. Some foods, such as fish, bananas and turkey, contain an amino acid called tryptophan. Satisfying your hunger by eating foods rich in tryptophan promotes sleep and might help you rest more soundly at nap and bedtimes, even during the last uncomfortable week of pregnancy. If you can't control your hunger, keep only healthy foods in your house at all times. Eating an entire watermelon is a lot healthier than an entire bag of potato chips. What Are the Causes of Always Being Hungry?